Thank you for your interest in submitting a Charitable Donations Request. We continually strive to support the environment and the communities we serve. Whether it’s thru global outreach programs or technical development, we look forward to partnership opportunities that align with our goal to help positively impact the international communities we serve. 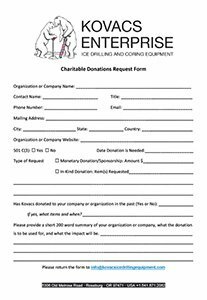 To submit a request, complete the Charitable Donations Request Form and email it to info@kovacsicedrillingequipment. Once a request has been submitted, an acknowledgement email will be sent to you. We will review your request, determine if your opportunity is a fit for us, and will respond to all proposals within 4 weeks of submission.